The Japanese American National Museum will host a four-week series of “Common Ground Conversations” in the galleries of its Common Ground: The Heart of Community exhibition beginning January 12, 2017. Sessions will take place on consecutive Thursday evenings from 7 p.m. to 7:30 p.m. and each will focus on a different topic. Staff members of the museum’s education department will lead each session and facilitate the discussions. Admission is free. 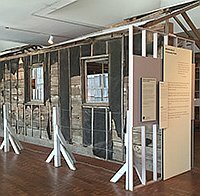 Common Ground features hundreds of objects, documents, and photographs that chronicle 130 years of Japanese American history, beginning with the first generation of immigrants to the United States (Issei). The World War II incarceration of Japanese Americans as well as the military service of Japanese Americans during the war are prominently explored. Elements of the exhibition will serve as jumping-off points to start each week’s conversation. The series is intended to allow guests to participate in meaningful exchanges centered on the week’s topic, using Japanese American history to delve into contemporary issues and current concerns. No tickets or RSVPs are required. “Common Ground Conversations” coincide with JANM’s free admission on Thursdays starting at 5 p.m. Between 1942 and 1944, thousands of incarcerated Japanese Americans were moved from concentration camps to farm labor camps as a way to mitigate the wartime labor shortage. In the summer of 1942, Farm Security Administration (FSA) photographer Russell Lee documented four such camps in Oregon and Idaho, capturing the laborers’ day-to-day lives in evocative detail. Uprooted: Japanese American Farm Labor Camps During World War II presents a selection of those images, many of which have never before been exhibited.